Source: Centre for Mennonite Brethren Studies, Winnipeg, MB. Anna Thiessen (26 January 1892-1 April 1977) was the oldest of 13 children born to Jacob W. and Helena Siemens Thiessen at Wassieljewka, Russia. 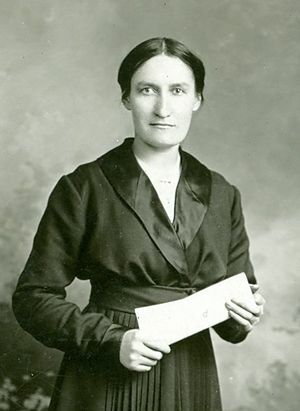 She immigrated with her parents to Manitoba in 1903. In 1906 the family moved to Herbert, Saskatchewan, where Anna attended Bible school for two years. In 1915 she went to Winnipeg, where she devoted the rest of her working life (except for two years, 1923-25, attending the Bible Institute of Los Angeles) to city mission work with Mennonite refugees from the Soviet Union and to the Mary-Martha Home girls' home program. The girls' home was an effort to assist Mennonite young women who came to Winnipeg to work in domestic service. Thiessen furnished a home-away-from-home at her Mary-Martha Home, where gatherings were held on Sundays and during the Thursday afternoon "day off" for domestic servants in the city. She was a surrogate mother but also a friend and a sister. On occasion she intervened to curb exploitation by employers. In these and other ways Anna Thiessen took care of physical and spiritual needs of the girls (Sunday schools, Dorcas Circle, and other challenges to service). In 1932 the Mary-Martha Home was permanently housed in a 16-room house at 427 Mountain Ave. The work continued at that location for 27 years and included following up on the women after they left domestic service as well as annual reports to the Canadian Conference of Mennonite Brethren Churches. Epp, Marlene. "The Mennonite Girls' Homes of Winnipeg: a Home Away From Home." Journal of Mennonite Studies 6 (1988): 100-114. Wiebe, Katie Funk, ed. Women Among the Brethren. 1979: 118-28. Sawatzky, Reynold. "Thiessen, Anna J. (1892-1977)." Global Anabaptist Mennonite Encyclopedia Online. 1990. Web. 21 Apr 2019. http://gameo.org/index.php?title=Thiessen,_Anna_J._(1892-1977)&oldid=126759. Sawatzky, Reynold. (1990). Thiessen, Anna J. (1892-1977). Global Anabaptist Mennonite Encyclopedia Online. Retrieved 21 April 2019, from http://gameo.org/index.php?title=Thiessen,_Anna_J._(1892-1977)&oldid=126759. Adapted by permission of Herald Press, Harrisonburg, Virginia, from Mennonite Encyclopedia, Vol. 5, p. 884. All rights reserved. This page was last modified on 4 November 2014, at 08:02.